Explanation: Yogi is possibly the best photographed rock on Mars. By combining many pictures taken during the Mars Pathfinder Mission last year, scientists were able to create a super-resolution, digitally enhanced image that better allows them to study Yogi's surface and more accurately determine how Yogi was formed. 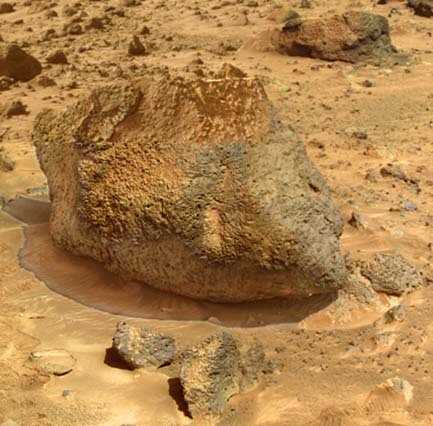 The smoothness of some Martian rocks suggests previous interactions with water, implying that Mars was both warmer and wetter in the past.